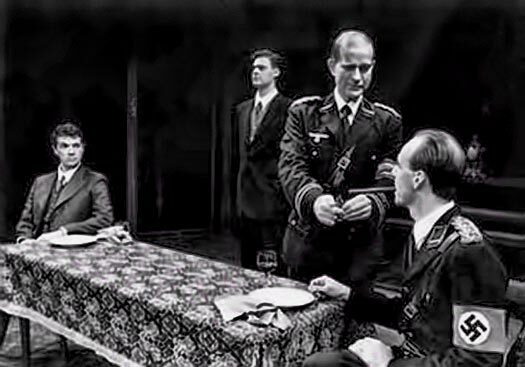 Paul Schoeffler (seated, left) as Raoul Wallenberg and James A. McCammond (seated, right) as Colonel Eichmann in Walnut Street Theatre production. You cast me in the chorus of Another Kind of Hero as a 14 year old child in 1992, and this production remains the single most formative and memorable experience of my life. 25 years later, I can still remember the music as if it were yesterday. I did not make theater my profession, but it will always be my passion, and I just wanted to thank you for giving me such an incredible opportunity and experience all those years ago. Wow! I stumbled upon this website while I was researching the history of the Walnut Street Theatre, and what a shock! I originated the role of Young Jacob in the Canadian Premiere of Another Kind Of Hero in Toronto in the 90s. Though I have been able to remember bits and pieces of lyrics and melody through the years, I am so glad to be able to listen to the music again! Thank you! Just like Tracey, I made my professional stage debut in this show at the age of 12. It was an experience I will never forget! I’m so glad to have this website to come back to and listen to the beautiful music that I still sing to myself often. Thank you for the gift of this powerful show. So thrilled that you have shared this Betsy and to see how much others enjoyed yours and my mother’s beautiful songs!